Maltmakers' (or Lapin) house (Gogol Street). The Pskov market place was located in this part of the Outer City in the early 16th century after it was transferred here from Dovmont's Town upon Pskov's union with Moscow. Old documents tell us what was sold there. For instance, a list dating from 1585-1587 enumerates the trading rows. There was the Surozh row where silks, fabrics, silver, gold, can-dles, and incense were sold. (Goods brought from beyond the Sea of Azov were usually called Surozh goods). There were rows for the sale of furs, fur coats, sheepskins, coarse grey cloth, saddles, boots, soap, old clothes, hats, caps, mittens, silver, buckets, chandler's goods, sleds, fancy sheaths for weapons in leather and velvet, even bows with arrows in quivers. There was also a row for ladies' haberdashery items: thread, needles, pins, hooks, thimbles, but-tons, rings, beads, perfume, and creams. There was a row where icons were sold, as well as grain, meat, salt, and buckwheat rows. A great many of these goods were made, transported, and sold by the owners of the stone "chambers" in Pskov. There is an interesting story from the commercial life of old Pskov. It occurred at the very beginning of the 18th century. By agreement with some English merchants, some Pskov mer-chants brought three shiploads of flax to London. The London merchants very justly reckoned that the Russians would not send their goods home again, and decided to lower the price. However, the Pskov merchants pre-ferred to burn t heir ships rather than compromise their honour. Impover-ished, they spent two years making their way home. Peter the Great re-warded the merchants and re-imbursed them for the value of their ships. The Maltmakers' House is located near the new market place. Gogol Street, quiet and of moderate breadth, lined with low-modern buildings on both sides, winds steeply downhill towards the Pskova River and ends with a view of the Church of St. John the Divine on "Misharin Hill" which rises far beyond the Pskova and seems very small from the hill. Many of ancient Pskov's streets also ended in churches built on the other side of the river. Architects of the time realised that a city's attractiveness de-pended not only on the number of "architectural monuments", but also on the way in which they were placed in relation to each other, the way in which one approached them. The Maltmakers' House is a rich merchant's house built in the early 17th century. It received its name, "Maltmakers"' (i.e. a place where malt was made), in the 19th century when it be-came a brewery in an altered form, without its upper floors. Scholars have shown that the stone part of the building had one more floor - a third floor which was probably destroyed in the 18th century. This upper floor was devoted to living space, and the two floors that still exist were used for storing goods and the owners' valuable property: furs, costly clothing, carpets, weapons, crockery, and jewelry. 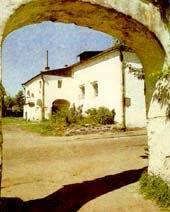 It was built according to a typi-cal old Russian plan - two large rooms separated by a spacious entrance hall. Less costly goods, as well as honey, wine, leather, and fat were kept in the basement beneath these storerooms. The area in front of the Maltmakers' House is open and clearly visible. To the left of the porch there are arched win-dows in rectangular niches for shutters. The windows to the right of the porch were later made larger. The porch of the Maltmakers' House is severe and beautiful. Its arches rest on round pillars with flat capitals made of square blocks. By the entrance way the pillars go straight into the ground; for Pskov's squat style they even seem slender. The wall over the lower landing has two small windows facing in dif-ferent directions and used as guard windows. The stairs have stone steps so high that it is difficult to mount them. At the top of the staircase there is a niche for an icon-case cut into the back arch. It is light beneath the vaulted ceiling, and the sky can be seen through the arches.